The Cleveland Gladiators are one win away from Arena Football League glory, but you aren't hearing much about it. 1964. Four digits burned deep into the minds of Cleveland sports fans, marking the last year that a major sports franchise in the Rock 'n' Roll Capital of the World won a title, when the Cleveland Browns defeated the widely favored Baltimore Colts 27-0. However, there's another football team in Cleveland that has a chance to be named the best in the nation, one that has had a lot more success in recent years than the Browns. The Cleveland Gladiators will host the Arizona Rattlers Saturday, Aug. 23 in ArenaBowl XXVII after a season in which the Gladiators broke records for most wins and winning percentage in Arena Football League History, although this may be the first time you've heard about any of this. You see, some NFL fans don't really look upon the AFL favorably, what with the rebound nets for missed field goals and kickoffs, three-man offensive lines, and padded barriers acting as sidelines. 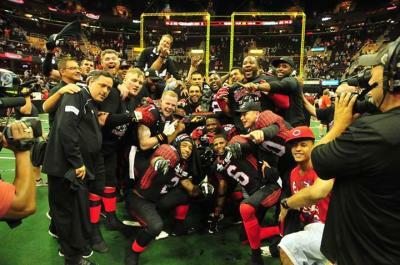 A Gladiators victory in ArenBowl wouldn't even be the first championship for Cleveland team since 1964, after the now-defunct Cleveland Crunch earned National Professional Soccer League titles in 1994, 1996, and 1999, but it's hard to attract too much attention when you play in a sport that barely registers a blip on the ESPN radar. However, it's not like what the Browns have been offering up in recent decades has been all that special, leading one comedian to dub FirstEnergy Stadium "The Factory of Sadness" (Some NSFW language in that link because, you know, depressed Browns fans). The Gladiators may not play in one of the four major sports leagues, but at least they might actually win something. Even Erieites who don't follow Cleveland have something to root for, with former Gannon University defensive lineman Randy Colling on the Gladiators roster. It may not feel as special as a Browns, Indians, or Cavaliers title, but at least Cleveland fans have something to root for this Saturday. For now, I'll leave you with some magic courtesy of Hector Marinaro's left foot.